What is gadfly? What is it used for? Also known as the tabanus or horsefly, the gadfly is among the largest of all two-winged insects. Gadflies are known for the irritating buzzing noise they make and their preponderance for large animals, such as cattle, on which they feast with large, formidable mouth parts. Gadflies can grow quite large (reaching an inch in length) and look much like the typical housefly. In terms of herbal medicine, only female gadflies are used. They are typically caught in May or June, then boiled or steamed and allowed to dry in the sun. In traditional Chinese medicine, gadflies have bitter, slightly cold and slightly toxic properties. They are associated with the Liver meridian. The main functions of gadfly are to invigorate the blood and remove stagnation. Among the conditions gadfly treats are masses in the abdomen and intestines that may be caused by blood stagnation, amenorrhea, and pain caused by external injury. How much gadfly should I take? The typical dose of gadfly is between 1 and 1.5 grams. Smaller doses (0.3 grams) can be taken if baked, powdered gadfly is being used. What forms of gadfly are available? Dried, powdered gadfly can be found at some Asian markets and herbal shops. 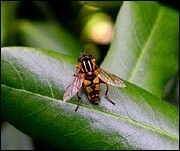 Gadfly is also incorporated into pills and capsules, and is often a part of larger herbal formulas. What can happen if I take too much gadfly? Are there any interactions I should be aware of? What precautions should I take? As of this writing, there are no known drug interactions with gadfly. However, because of gadfly's somewhat toxic properties, it is contraindicated for use by women who are pregnant or breastfeeding, and by children. As always, make sure to consult with a licensed health care provider before taking gadfly or any other herbal remedy or dietary supplement. Ahn MY, Ryu KS, Lee YW, et al. Cytotoxicity and L-amino acid oxidase activity of crude insect drugs. Arch Pharm Res October 2000;23(5):477-81. Kazimirova M, Sulanova M, Kozanek M, et al. Identification of anticoagulant activities in salivary gland extracts of four horsefly species (diptera, tabanidae). Haemostasis May-December 2001;31(3-6):294-305. Kazimirova M, Sulanova M, Trimnellt AR, et al. Anticoagulant activities in salivary glands of tabanid flies. Med Vet Entomol September 2002;16(3):301-9. Rajska P, Pechanova O, Takac P, et al. Vasodilatory activity in horsefly and deerfly salivary glands. Med Vet Entomol December 2003;17(4):395-402. Strother S. Genus tabanus. Tabanids (horseflies). What is this insect and how does it affect man? Dermatol Online J November 1999;5(2):6.